LIEVT held the regular meeting at the East Meadow Firefighters’ Benevolent Hall on Wednesday, March 9, 2016. Forty plus members were in attendance. They enjoyed an excellent dinner, dessert, coffee and drinks served by Artie and Phyllis Sperr. Click Read More below for the minutes, or click on the picture to see pictures from the meeting. LIEVT had the first regular meeting of the year at the Copiague Fire District on Thursday, January 14. More than fifty members were in attendance. They enjoyed an excellent dinner and dessert – they were presented with chefs’ hats. 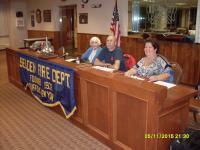 The regular meeting of LIEVT was held at the Selden Fire Department on Thursday, November 5. The attendees were made to feel welcome by the Dictrict Manager, Joe Egan. 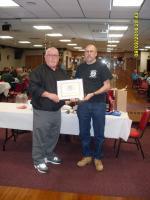 Their members served an excellent home cooked turkey dinner. Our president, Bill D’Allesandro gave them chefs’ hats. The regular meeting of LIEVT was held at the Wantagh Fire Department on June 29, 2015. Wantagh fire fighters Dave Goetz and Larry Diaz manned the barbeque. Parker Browne generously provided the ingredients for the large group of attendees. The LIEVT meeting was held on Wednesday April 8, 2015 at the Brentwood Fire District Headquarters. About fifty members enjoyed an excellent dinner – the appetizers and salad were followed by a roast beef dinner with baked potatoes and vegetables served on real dishes with silverware and tablecloths followed by coffee and dessert. This site serves as an archive of minutes and photos from meetings for member reference. Members receive email notifications of upcoming meetings and events, and a Facebook group page (see link at right) provides a general forum for members. Click the icon to download the 2019 form. Print and mail along with dues check (or promise to pay) to the address on the form! The EVTA forum is a bulletin board system free for any EVT to join. The forum is not associated with LIEVT in any way and requires registration. LIEVT members are encouraged to investigate this resource.